Welcome to imgflip blizz_the_kid. If you have any questions about the platform, feel free to ask. 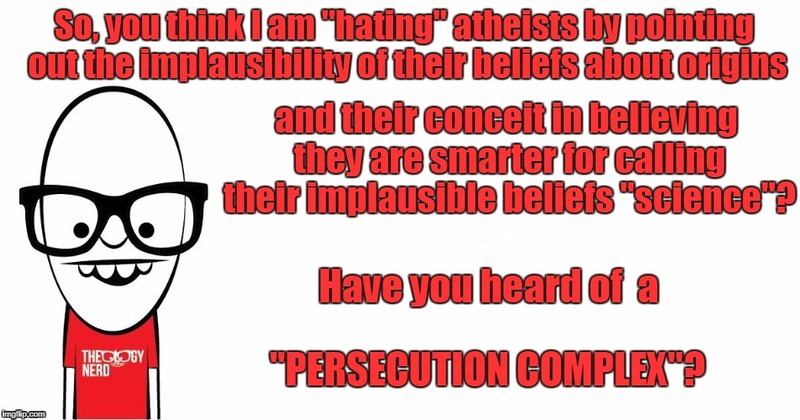 why are there so many memes about hating atheists?!?!?!?! but there is a difference, science is based on studies and people test the theories that they come up with and see if it is true or false, science changes each day. religion, on the other hand, is based on what some people believed thousands of years ago and rarely changes. What people believe about origins is based on their presuppositions concerning the unobservable past. No matter what the results of any modern scientific study, those people are going to interpret the results to fit their presuppositions about the past. Some go into the study with confirmation bias in order to confirm what they already presuppose about the past. The past which can't be observed, tested, measured, and demonstrated that it was the way they claim it was. Some people recognize their presuppositions as "faith" and some others call their presuppositions "scientific." If it was the result of one person's research and study, you could say that confirmation bias may have skewed the results. But when thousand of people do research and they all come to the same conclusion using the same data and evidence and testing and methodology, confirmation bias seems much less likely. 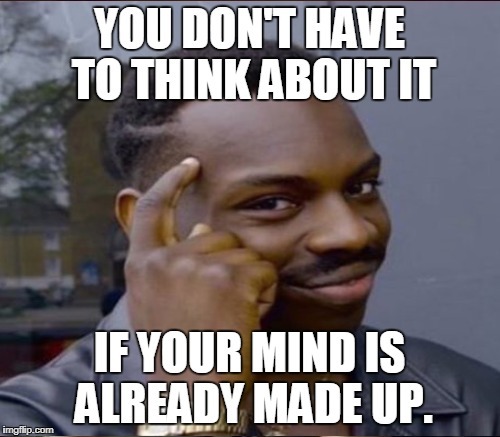 Besides, the scientific method is designed in such a way that it weeds out as much conformation bias (and other cognitive biases) as possible. One person says Jim is a horrible guy, a real jerk. You might chalk it up to that person having a bad experience with Jim, not liking him or even having an axe to grind against him and wanting to slander his character. Now what if you asked one hundred people about Jim and they all said the exact same thing. Wouldn't that be a more convincing argument that Jim is indeed a horrible person? I concur that thousands of people can repeat the same tests and research that have the same results. The confirmation bias comes in when the people draw their conclusions from the same results based on their presuppositions, whether they are people of faith or secularists. I think it applies to both, the research and interpretation of the results. But I'll give you an upvote for your courteous reply. May I ask what methodology, equipment and research procedures they used in Old Testament times? This is irrelevant to me based on my previous reply. We draw our conclusions based on our presuppositions when we look at the same results from modern methodology, equipment and research. The difference between our beliefs and religious beliefs is that our beliefs don't require faith; they require evidence. What people believe about origins is based on their presuppositions concerning the unobservable past. No matter what the results of any modern scientific study (aka your "evidence"), those people are going to interpret the results ("evidence") to fit their presuppositions about the past. Some go into the study with confirmation bias in order to confirm what they already presuppose about the past. If people with presuppositions about the past would interpret results and change their beliefs to fit the science, then what explains Creationists? What does confirmation bias have to do with our science? The reason most of our scientists in our age are atheists is because they were either formerly religious, or the believers who could've beeen in our science field decided that they have the answers instead. Those who recognize their presuppositions as faith are fine, until they start taking the idea that they're right against other people, which is what I see Christians on this site and in positions of power do all the time. I never said anyone changes their beliefs to fit the science. They interpret the results of the science to fit their presuppositions, atheists and creationists do it. The science doesn't change. Very few creationists who are scientists have any problem with the methods that non-creationists scientists use. They only have a problem with the presuppositions that the non-creationists bring to the scientific method. When you mention observing the past with stars and fossils those are two fields in which the observer's presuppositions effect their observing/measuring. So the past is unobserveable and unmeasurable apart from ones presuppositions. That is why most creationists scientist differentiate between "historical science" and "operational science." You even recognize that the past has to do more with history. People who call their presuppositions "science" as if their presups are "facts" are worse than the religious faithful who are "taking the idea that they're right against other people." 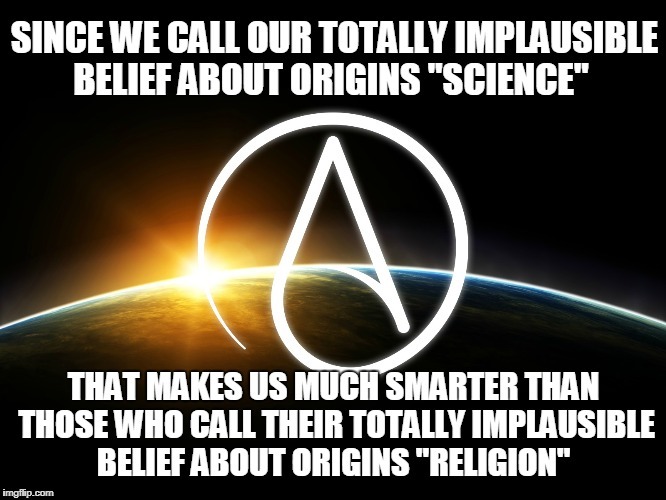 SINCE WE CALL OUR TOTALLY IMPLAUSIBLE BELIEF ABOUT ORIGINS "SCIENCE"; THAT MAKES US MUCH SMARTER THAN THOSE WHO CALL THEIR TOTALLY IMPLAUSIBLE BELIEF ABOUT ORIGINS "RELIGION"